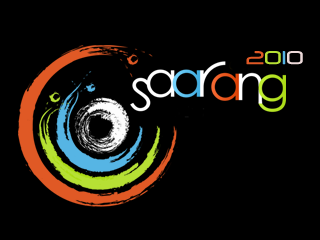 This is the third time I am attending saarang and this time it's kinda special to me, since this is the first time I am attending it as an IITian... btw, for the people who dont know what saarang is... It's only 'the most' popular cultural fest in the country which is hosted/conducted by IIT Madras. it usually happens in the last week of January every year. in this 4 day long youth festival, guys and girls from all over the country turn up to the campus to be spectators/participants in various events and shows. it's also the most 'coulourful' event that happens in chennai... and atleast 50-60% of the gentlemen crowd come because of this reason. Dr. Balamuralikrishna's 2 hr long kutcheri, which was the opening event, was incredible. when u listen to him sing, you wonder how someone can have such a sweet and distinguished voice, for like 40+ years... crowd went crazy when he sang all his signature songs, especially when he performed "paluke bangara mayana...". he's a legend! The same day in the evening, 'choreonite' was the spotlight event. many colleges have come to show (off) their talent. 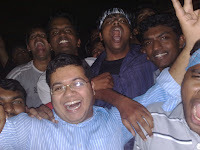 some of them even from outside chennai (Bangalore, Trichy, Coimbatore etc). And guess what... My college (UG) SVCE, also came and performed. Though I was the only guy who cheered/shouted for them when they stareted, they gave a very good performance and the crowd did enjoy it! and of course, the performance by Loyola college, one of the most ancipated performances of the evening, did live upto the expectations. I had to explain to my MBA classmates, who asked me about Loyola, that it was the parent college of 'LIBA' B-school, on hearing which they were all like "ooooooh ok". I have to mention the performance of Stella Maris college. I call it the angel dance . If there was a college in chennai, with only good-looking girls and nothing else, it must be stella maris (MOP Vaishnava college girls - I've not forgotten you people, but face it - stella it is!). Btw CET won the event and runner up was NIT trichy. The next day, I dint miss that much, like I did the previous day. I started the day attending the DJ workshop, which btw happened in my department and my own class room. DJ Kave, DJ Prashant and DJ Zen - thanks you guys! now I can scratch the disc and know how to use the turn table etc... atleast I can pretend that I know all that :-). then I went outside to repair my cycle, which btw is a totally unwanted piece of information in this blog (sorry folks). afternoon was good fun. there was this hip-hop competition which happened at the SAC(IIT's main auditorium). have you seen the movie 'stomp the yard'? if no, then pls skip to the next paragraph... it was exactly like that. this kinda thing happening in India, that too chennai!!! India is now a developed country, in my opinion . it was basically a 'dance off' between two teams. they dance for pre-recorded hip-hop stuff. and the stunts those guys performed, was amaaaaaaaaazing. the guys who performed had really practiced very hard i would say. at a certain point it looked a bit dangerous as well. i was just like that movie. Then there was this prelims for all the metal bands in front of SAC. 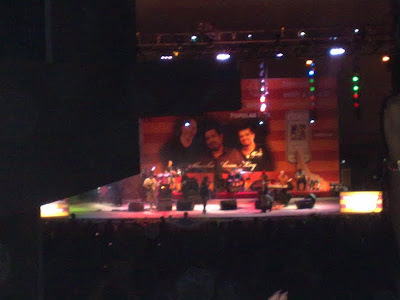 each band had to perform for 15 mins, irrespective of the number of songs. the qualified bands got to perform at the OAT (open air theatre) -bigger, better setup (which I did miss - not completely though). after that I had a shawarma in the food court and bought myself a saarang t-shirt (unwanted info number 2). Next day was pretty Ok as well. i went to the CLT complex where a number of workshops were taking place. pottery workshop etc (i wonder what makes people want to learn pottery n all - but to my surprise a lot of people were doing that. people who fall in the following categories: geeks, nerds, dorks :-) - (all in the name of good fun)). then i went into the 'face painting' workshop. No...! its not what you think. i would never give my face to anyone to scribble on it! but a couple of my friends did!!. I passed on a bad comment (like a poor rating) on the painting done on my friend's face, and got abused by a girl who did the painting... (well! that's me). Then after that, I along with my friend went on to see the fashion show in the SAC. we waited for sometime and lost patience. so much for the fashion show. we came out even before it started. I had to submit an assignment that day. so I had to sacrifice Saarang activities for the rest of the day. Evening came, and it was time for the most awaited event of Saarang 2010. SEL (shankar-eshan-loy) show. any luck finding the videos ??? pls leave your email address here! i've got the video/clip of only one performance from the choreonite and that is by SVCE, chennai. still no luck in finding CET videos!!! would u be interested in the video that i have?